Is there life after death? If so, what is the nature of that life? These questions have always been with us, and the search for their answers is an intrinsic function of the human psyche. In recent years interest in reincarnation has grown, with new advocates, theories, and discoveries. Testimonies by persons who have returned from the verge of death after supposedly glimpsing the hereafter have intrigued modern parapsychologists, as well as researchers like Elizabeth Kubler-Ross, author of On Death and Dying, and Raymond Moody, author of Life After Life and other bestsellers. 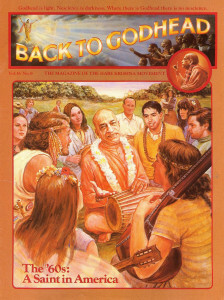 The original source—books on reincarnation, however, are the Sanskrit Vedic, literatures. The Srimad-Bhagavatam, for example, gives a fascinating account of the near-death experience of a man named Ajamila. Unlike modern investigations, the case of Ajamila lets us study the near-death experience not from the viewpoint of the dying person but from the viewpoint of higher beings present at the time of the soul’s passing out of the body. In the case of Ajamila, the messengers of Death wanted to drag the soul to hell because of his life of sin. Although Ajamila lay in a coma, he was conscious of the messengers of Death preparing to transfer him to the lower regions. But suddenly the beautiful, effulgent messengers of, Visnu arrived and intervened. The messengers of the Lord said the messengers of Death had misjudged the soul of Ajamila and had no right to take him. Incensed, the messengers of Death explained why Ajamila should be taken and punished. Judging a person’s karma, they said, is a relatively simple thing. At the time of death, when a soul is ready to enter another body, the superintendent of Death arranges for a future body in accordance with the particular soul’s past sinful and pious acts. Because Ajamila had led a sinful life, he was now due to be punished. The messengers of Death gave an analogy: As springtime in the present indicates the nature of springs in the past and future, so this present life of happiness or distress indicates one’s activities in the past, and one’s present activities are an index of one’s future incarnations. In other words, on the basis of the activities a person performs in his present life, the higher authorities determine his destiny in the next life. Since most people incur at least some bad karma, it is the duty of the messengers of Death to transfer them to a lower position. Most people act without any understanding of the law of karma and thus commit all kinds of abominable acts for the pleasure of the present body. They do not know that their present suffering is a result of past sins, nor are they able to understand that their present sins will cause them future suffering. Acting in the darkness of ignorance, most people are unable to know their past or future lives. And even when they hear from the Vedic literature about transmigration of the soul and the law of karma, they refuse to accept that there is anything beyond this present life of sense .gratification. Such an ignorant person was Ajamila. And because of his life of sin, the messengers of Death saw no reason why the messengers of the Lord should obstruct their work of awarding him his just karma. The messengers of Lord Visnu, however, asked the messengers of Death on what basis they had judged Ajamila. The messengers of Death replied that they had judged him according to the religious scriptures. They then read a long list of criminal, violent, irresponsible, irreligious, and perverted acts Ajamila had committed. At this, the messengers of Visnu admitted that hellish punishment would ordinarily await such a sinner but in the case of Ajamila, this did not apply. The extraordinary circumstance in Ajamila’s case was that at the last moment of his life he had called out the name of God, Narayana. Although he was not thinking of God but of his son Narayana, he had nevertheless called out, “Narayana!” This had neutralized all Ajamila’s bad karma and had saved him. The messengers of Visnu explained that Ajamila’s uttering the name Narayana had absolved him of all his sins—not only those of his present life but those of millions of past lives. He had chanted without offense and was therefore purified and eligible for liberation. The messengers of Visnu explained that even if a person chants the name of God indirectly (to indicate something else), jokingly, for musical entertainment, or even neglectfully, the holy name will still free him from the reactions of all sins. No matter how sinful a person may be, the holy name of God has the power to absolve him and save him from hellish punishment. Unable to oppose the higher authority, the messengers of Death released Ajamila. The supernatural beings vanished, Ajamila awakened from his coma, and by the grace of the Lord he was able to spend his remaining days in devotional meditation on the Supreme Personality of Godhead.